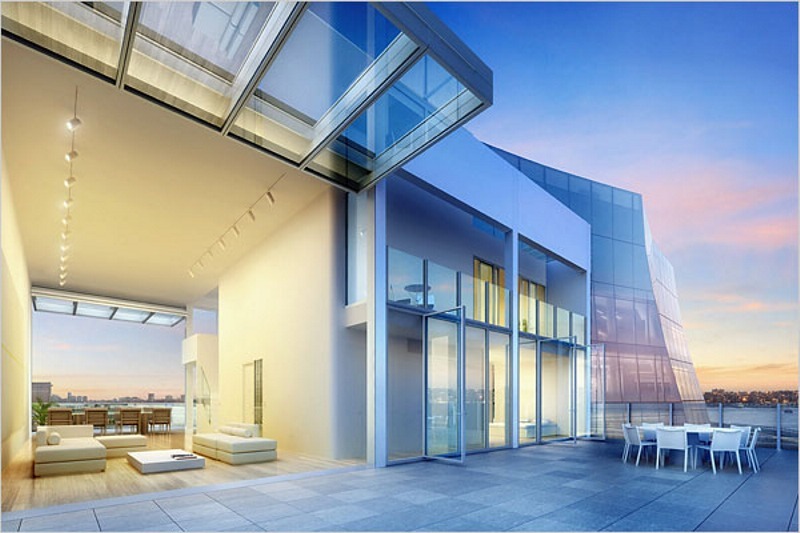 One of the hot spots for architecture right now is the Chelsea neighborhood in New York City. Next to several glitzy new glass-walled skyscrapers lies this elegant condo that stands to have a bigger influence on architecture over time. Designed by internationally-renowned architect Shigeru Ban, these Metal Shutter Houses have a kinetic façade that allows the occupants to open their loft-like spaces up or close them off from the elements. 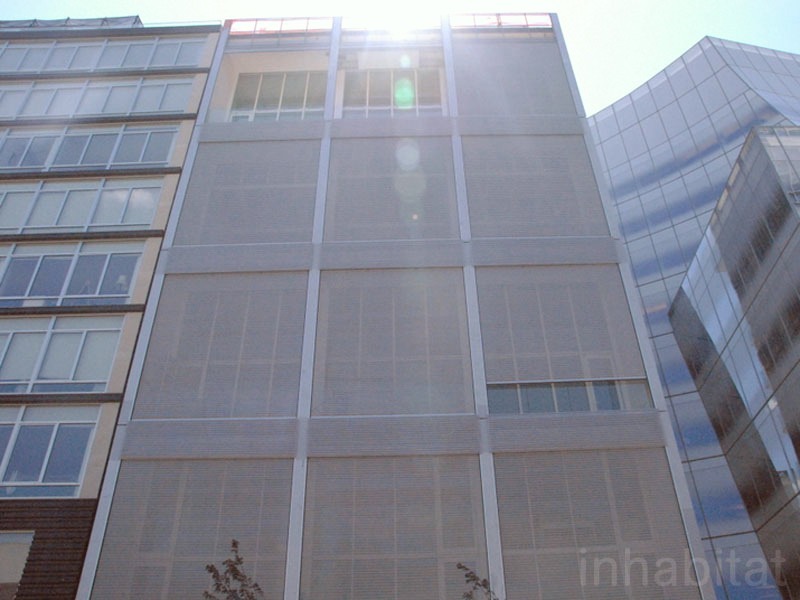 The “removable skin” is a simple but effective way to allow the building to adapt to changing environmental conditions without resorting to energy-intensive measures. 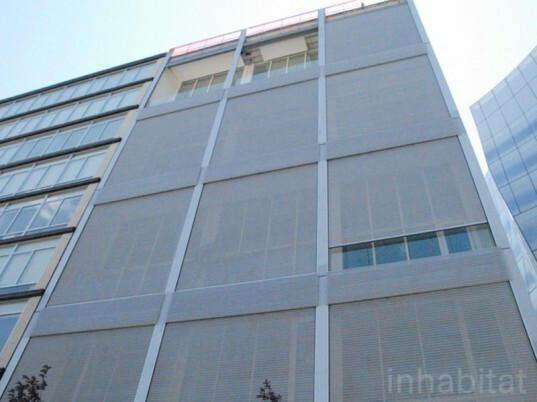 This is the first project in the US by the respected architect Shigeru Ban. The minimalist building is stripped down to its fundamental elements — the simple boxiness of the 11 story building opens fully to the street, where a series of commercial metal shutters protect the large living spaces inside. Thanks to the twenty foot-wide shutters and operable glass walls the occupants can control their living space to suit their needs — they can let the daylight stream in or, conversely, close the shutter to deflect the hot glare and maintain their privacy. The windows fully open as well, letting the outdoors pour in on a pleasant day. Mr. Ban is known for using simple materials in new ways. The windows use the same technology as folding airplane hangar doors. The application of outdoor shutters at this scale greatly outperforms even the most advanced glass in terms of energy efficiency. Shutters are a surprising solution — perhaps for their obvious usefulness — but also because of the rarity of external active shading over the last century. Commonly used as a way to control heat gain and glare before the advent of air conditioning and increasingly advanced glazing, the incorporation of shutters in design had virtually disappeared. The Metal Shutter Houses are notable for their use of this simple technology on a large scale, the value it bring to the occupants, and their low environmental profile. The living spaces are refined lofts — open and airy with private rooms to one end and public at the other. The interior is all about open space, the living room ceilings are 20 feet up, and unique translucent doors spread natural light throughout the space. The doors simply roll into the wall when not needed. Radiant floors efficiently heat the building. This is the first project in the US by the respected architect Shigeru Ban. The minimalist building is stripped down to its fundamental elements — the simple boxiness of the 11 story building opens fully to the street, where a series of commercial metal shutters protect the large living spaces inside. Thanks to the twenty foot-wide shutters and operable glass walls the occupants can control their living space to suit their needs — they can let the daylight stream in or, conversely, close the shutter to deflect the hot glare and maintain their privacy. The windows fully open as well, letting the outdoors pour in on a pleasant day. Mr. Ban is known for using simple materials in new ways. The windows use the same technology as folding airplane hangar doors. The application of outdoor shutters at this scale greatly outperforms even the most advanced glass in terms of energy efficiency. Shutters are a surprising solution — perhaps for their obvious usefulness — but also because of the rarity of external active shading over the last century. Commonly used as a way to control heat gain and glare before the advent of air conditioning and increasingly advanced glazing, the incorporation of shutters in design had virtually disappeared. They let air and some light in without glare or overheating, allowing the occupants to open the window wall behind the curtain, but still be protected from the elements. The application of outdoor shutters at this scale greatly outperforms even the most advanced glass in terms of energy efficiency. Shutters are a surprising solution -- perhaps for their obvious usefulness -- but also because of the rarity of external active shading over the last century. Commonly used as a way to control heat gain and glare before the advent of air conditioning and increasingly advanced glazing, the incorporation of shutters in design had virtually disappeared. The Metal Shutter Houses are notable for their use of this simple technology on a large scale, the value it bring to the occupants, and their low environmental profile. A dynamic, kinetic facade results, allowing the building to adapt quickly and easily to ever changing weather conditions. An interesting effect is how the building changes its look depending on weather conditions and the residents' desire for privacy. Next to the neighbors the Metal Shutter Houses' unique visual impact stands out. The windows fully open as well, letting the outdoors pour in on a pleasant day. Mr. Ban is known for using simple materials in new ways. The windows use the same technology as folding airplane hangar doors. The apartments run in the 2,200 square foot range, with two stories. The main floor is open from front to back. The top floor is a spacious 4,644 5 bedroom fully open-able masterpiece.